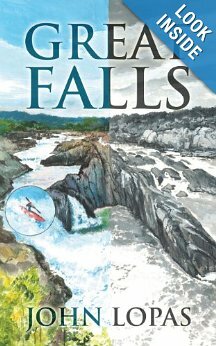 Great Falls is a unique time travelaction and adventure novel which I am sure you will enjoy reading. It starts out in modern day times and incorporates the civil war era. Dakota goes on a white water kayaking ride which he has done many times before--but this time something goes wrong and he finds himself in the midst of the civil war. Will he make it back? You will just have to read the book to find out. An accident sends Dakota to the past; a modern gadget threatens his future. Great Falls National Park, Virginia: Dakota Wesley drops his kayak into the river's shallow edge. Below him the waterfalls roar in a maelstrom of nature's fury. 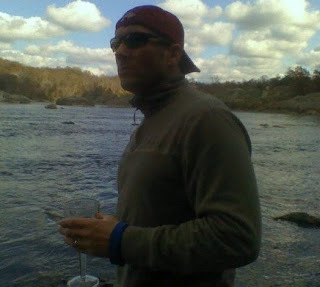 Shaking off last-second jitters, he peels out into the Potomac's chilly waters, the fast current sweeping his boat downstream and into the realm of no turning back...chasing the big whitewater thrill. But then something goes terribly wrong. 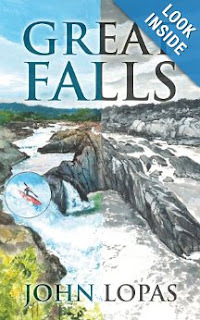 Expertly weaving a passion for the great outdoors with historical events, Great Falls is a unique and compelling new novel of unexpected journeys and chance encounters. John Lopas pursues his passions with an imaginative mind that incorporates his love of art, music, history and literature. While kayaking the Potomac River and its tributaries, as well as, exploring and hiking through Virginia and Maryland, John found the perfect backdrop for an encompassing tale along the Potomac river in the greater Washington D.C. area. His love of the outdoors and historical events lend a unique voice to this novel of unexpected journeys and chance encounters. He lives with his wife and two cats in the Baltimore area and is working on his next novel of the series. You really read a wide variety of genres. I like that! I go through different moods myself where I read different types of books. This one sounds great! Oh, I love time travel books. I will be reading this one for sure. This book sounds absolutely interesting, even tho I have never read a book of that genre! How do you find all these great books?! You sure love to read. Kudos to you. I would love to rad more. This book does sound interesting. That sounds very cool! I will add this to my list too! Love the time travel aspect! A book with nature and history as a theme would be a great read. I wish I could get myself to read as wide of a variety of books as you do! I tend to stick to the same things. The time travelaction sounds intriguing. What an interesting book, sounds like there's more action. I'm definitely adding this one to my reading list. I love the creative plot! I do a lot of reading but I don't ever remember reading about time traveling. cool book. must give it a try.